Enjoy reduced pricing on select homes, one month free and more! Scroll down for details. Discover destination living at Modera Parsippany, modern studio, one-, and two-bedroom apartments in scenic Morris County. This refined-meets-restorative retreat features smartly-appointed residences with elegant plank-style flooring, quartz countertops, and oversized kitchen islands. 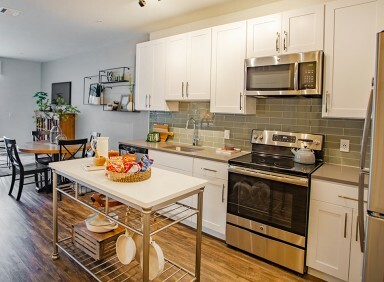 Meet Morris Plains apartments where style and serenity come together - with stainless steel appliances, generous walk-in closets, and tiled soaking tubs. Enjoy the privacy of home, or venture forth - moments from major thoroughfares and within easy reach of elite Fortune 500 headquarters. Come and go as you please with convenient access to I-80, I-280, and I-287, and Fortune 500 powerhouses. Here, home has it all - minutes from standout shopping and dining in the heart of New Jersey and an hour's drive to New York City. Curate the ultimate everyday itinerary with a two-story fitness center, a serene saltwater pool, and a designer clubroom. Find a world-class workspace right at home with a fully equipped conferencing facility outfitted with a signature coffee bar and ample telework venues that let you connect on your time. Here, the luxe amenity lineup goes on and on. With a dedicated parking deck, car care station, package concierge, dry cleaning drop-off, and dog wash, this upscale homebase takes care of the details and saves residents precious time. Find your haven at Modera Parsippany.